Marc Swanson is a contemporary American artist whose hand-made works combine a preoccupation with personal history and identity conflict. 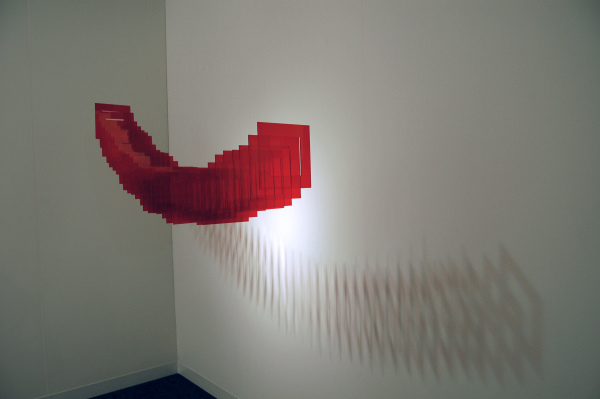 He works with a variety of media, including sculpture, drawing, video, and photography. In addition to his well-known series of rhinestone-based sculptures, Marc has embarked on a new installation of wall dioramas made with various materials, including light, wood, glass, fabric, gold and silver chain, and mirrors. The image shown above includes a photograph from the film Cat on a Hot Tin Roof and is from an edition of two. Berend Strik takes photographs but then alters them with mixed-media and embroidery. These mutations simultaneously underscore and undermine the reality presented in the photographs. 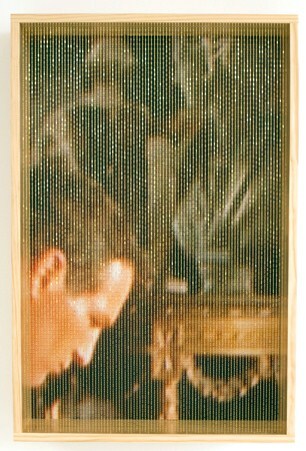 By perforating them with a needle and thread, the two-dimensional quality of the image is disrupted, creating a work that is both tactile and conceptually driven. The embroidered photographs and collaged textures contain a nuanced layering of pattern: fabric and image that come together to explore the notion of the exotic. Since 1987, Strik has been embroidering photographs. The narrative of the photo is subsequently changed, and new layers and realities are presented. Through this process, Strik plays with historic atmospheres and art historical clichés. 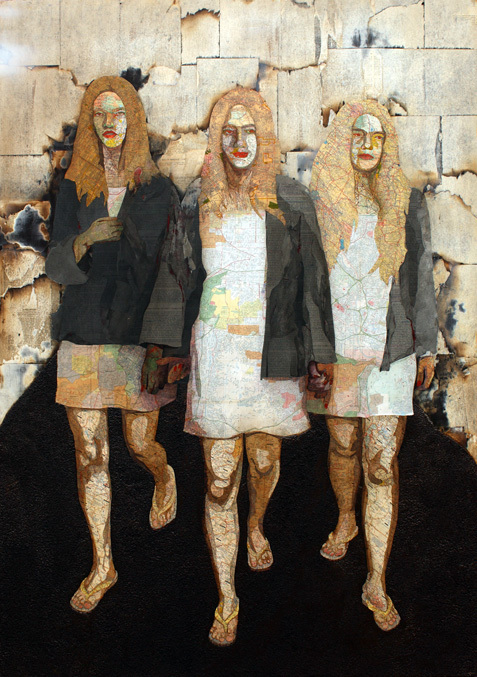 Another artist fascinated with collage is Matthew Cusick. He uses maps, book pages, Folger's coffee among other objects on wood panel to create his paintings, enhancing the visual quality of tone and density in his works. Most of the maps used for Cusick's pieces come from his own collection of world atlases, antique maps and school geography books. 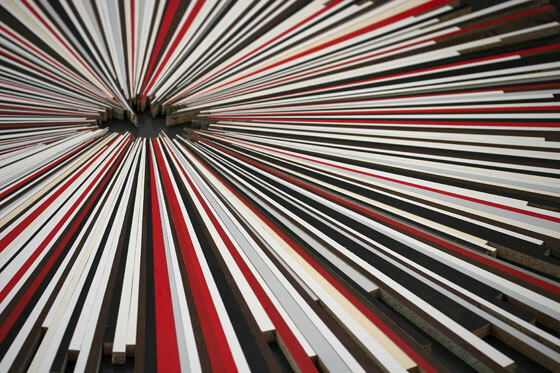 Munich-based sculptor Martin Wohrl was first introduced in the United States last year with a solo exhibition in New York City. He uses found wood on the street and materials sourced from budget hardware stores to craft his free-standing and wall pieces. The handcrafted detailing and sensitivity to patina and color elevate this seemingly minimalist platform into a sculptural work that can be enjoyed by all. 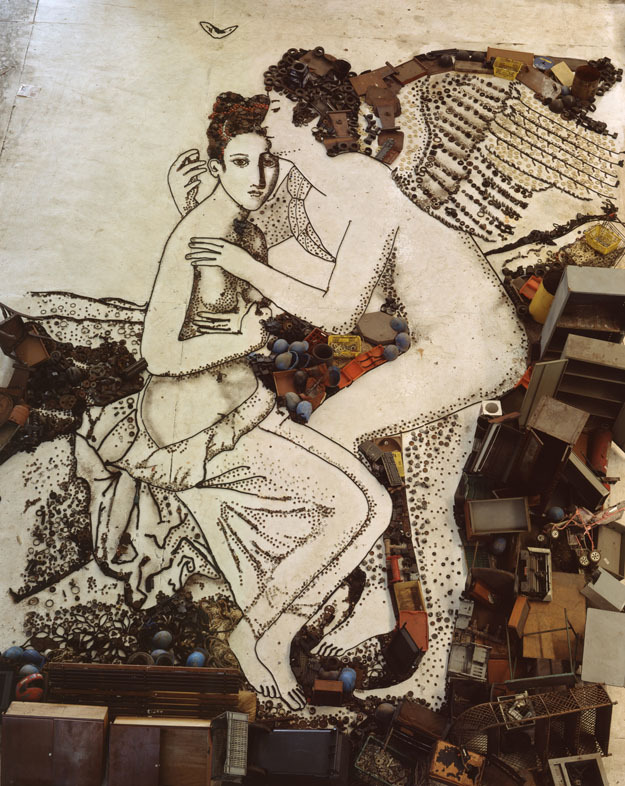 Well-known Brazilian photographer Vik Muniz also uses recycled objects for his masterpieces. 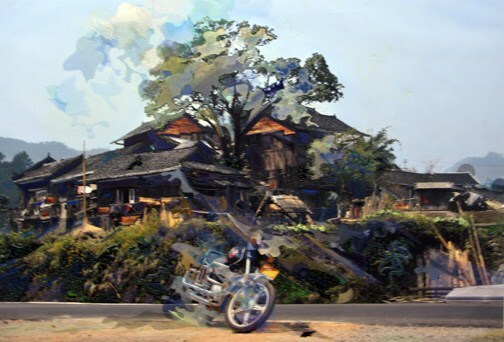 From puzzles pieces to chocolate to toys and objects found at a junkyard, Muniz creates images out of heaps of junk, paint pigment or cut-out paper (whichever series he is working with) and then takes an aerial photograph of the finished product. Muniz tends to re-create images from recognizable paintings in art history or people or places that are personally meaningful to him. Nina Bovasso's work re-interprets the language of high-modernist abstraction by blending psychedelic pop-art like references. 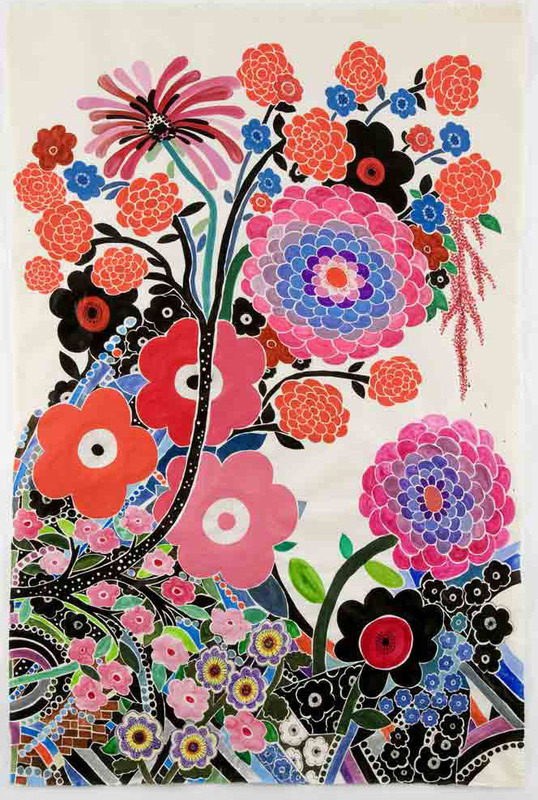 Her paintings are executed with water-based material-ink, acrylic, watercolor and gouache on handmade Abaca paper. 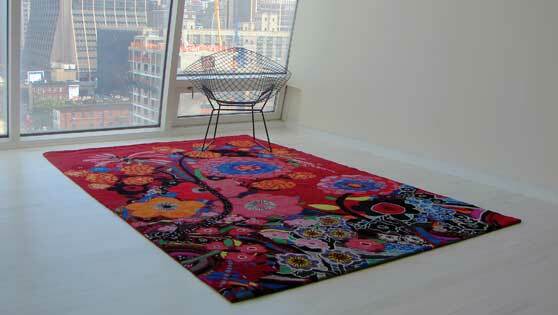 However, her newest venture has been reproducing one of her works as a limited edition handmade rug. Hand-knotted in the Kathmandu area of Nepal from high quality woven wool and silk, each rug is unique and signed by the artist on the back. Additionally, the Goodweave Certified label is on the back of each rug assuring that no child labor was used in the manufacturing of the rug. Furthermore, a portion of the purchase price helps to educate children in the Kathmandu area. James Siena and James Welling have also contributed designs for this project. David Nash, one of Britain's foremost sculptors, is renowned for his skillful and dynamic transformation of fallen or uprooted trees. He has developed an eloquent understanding of trees and the natural environment, successfully working with their traits to create sculpture, installation projects and related drawings. His large wood sculptures are sometimes carved or partially burned to produce blackening. 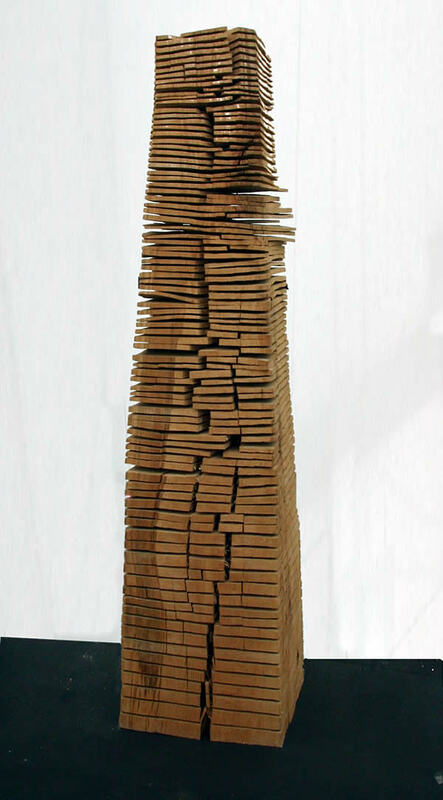 His main tools for these sculptures are a chainsaw and an axe to carve the wood and a blowtorch to char the wood. Nash's obvious dexterity with a chainsaw defies belief. Rosemarie Fiore's drawings are created by containing and controlling firework explosions. She bombs blank sheets of paper with different fireworks including color smoke bombs, jumping jacks, monster balls, fountains, magic whips, spinning carnations, ground blooms, rings of fire, and lasers. As she works, she creates the imagery by controlling the chaotic nature of the explosions in upside-down containers. 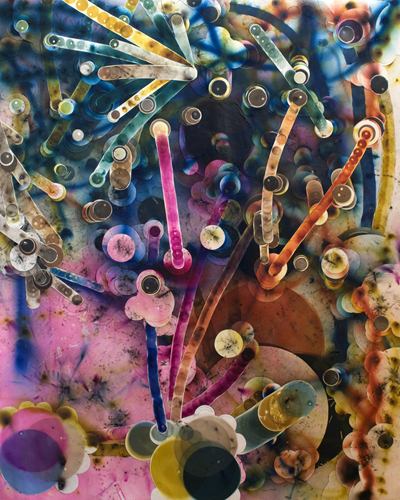 When the paper becomes saturated in color, dark and burned, she takes it back to the studio and collages blank paper circles onto the image to establish new planes and open up the composition. She then continues to bomb the pieces. These actions are repeated a number of times. The final works contain many layers of collaged explosions and are thick and heavy. Fiore considers the firework drawings invented dimensional spaces in which the forces of chaos and control fight with each other. The visible traces of the fireworks' detonations transform the explosive spectacle into fixed mini-universes of streaks, shooting sprays of vibrant pigments, and shimmering fields of color. 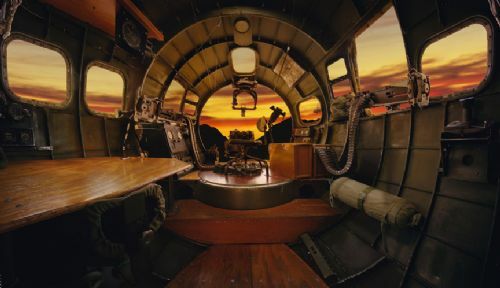 images of incredibly ornate truck or plane interiors with surreal socio-economic tableaus. These works explore the aesthetics of wealth as they relate to the poverty and oppression evidenced in much of the Western world. This tension between auspicious wealth and cultural naiveté is what inspires Gispert. His vividly colored photographs and booming sound sculptures have been widely shown throughout the United States as well as in Europe, South America, and the Middle East. The multimedia installation he created for the 2002 Whitney Biennial was one of the most critically acclaimed elements of that exhibition. Kiel Johnson's witty sculptures bring whimsy and craftiness together. This L.A. based artist uses cardboard, chipboard, tape and glue to build his likenesses of mechanical objects. His double-sided boombox stands more than 3 feet high and 4 feet wide amidst a pool of cardboard cassette tapes. 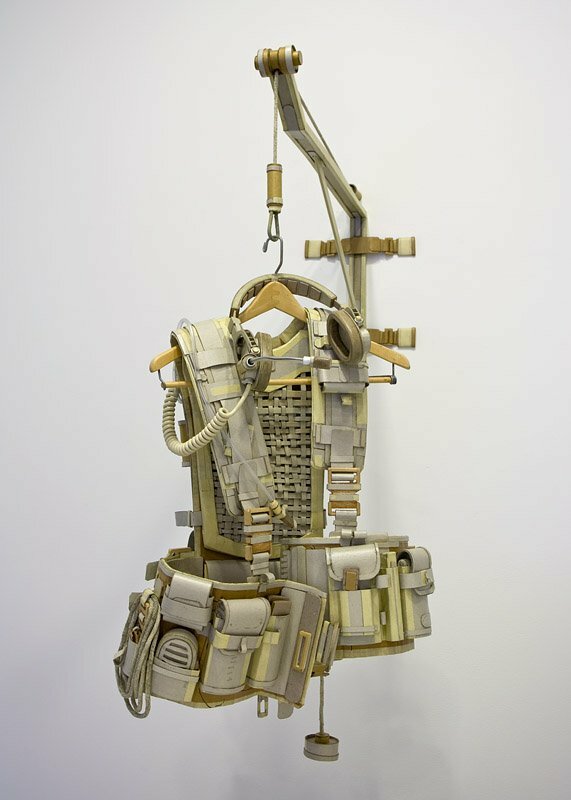 He has also created a survivor backpack with all the tools one would need for a long hike. All materials are archival and he will entertain commissions. Richard Klein is expanding on his investigation of the immaterial and the physical. 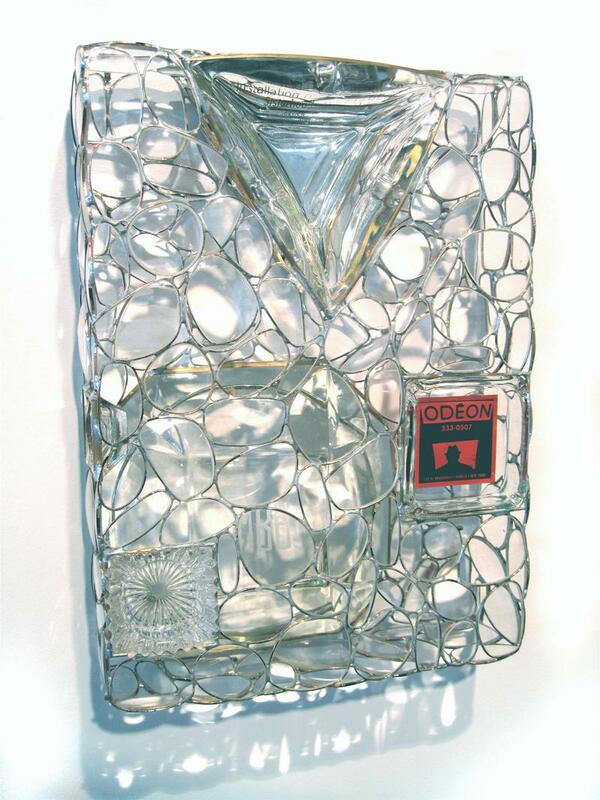 Primarily utilizing found glass objects, beginning with his signature eyeglass lenses, the artist's pallet has developed from the purely optical to components such as ashtrays and jar lids. Strategically placed corporate logos bring an additional dimension to the conceptual depth of Klein's work. His latest works, Cabinet and Monogram, make reference to iconic American objects: a bathroom vanity and a man's folded shirt. This is all done in his "spare" time since Klein is also the Exhibitions Director of the Aldrich Contemporary Art Museum in Ridgefield, CT.